Hello! Diana here to show you my take on this week's challenge at the Classy Cards 'n Such blog. I just love the colors and textures in the inspiration photo. 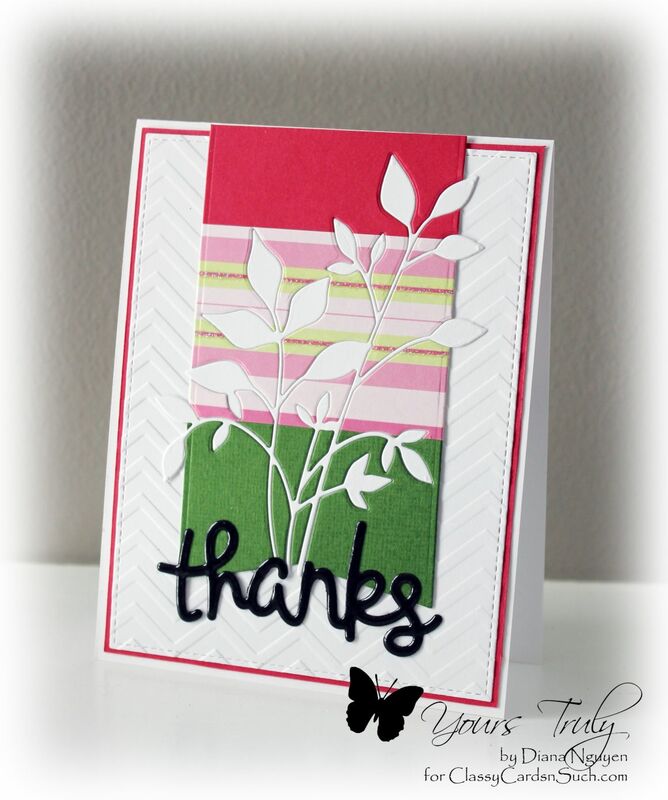 I first embossed a die-cut made with the large stitched die from MFT Blueprint 13 with a chevron embossing folder. I then stacked the colors from the inspiration photo onto a sheet of typing paper and die-cut the large banner from the same MFT Blueprint 13 set. I used the Memory Box Fresh Foliage twice - once on the color block tag and another on white card stock so that I could piece them back together for an in-laid die-cut. I love it that the Fresh Foliage extends beyond the tag. Tip: I found an easier way to do the in-laid die-cutting. I used to glue all the pieces down individually. Now I use a thin sheet of typing paper and cover it with an adhesive... using Scor-tape around the edges and anywhere there might be smaller pieces. I then alternate between the background pieces and the actual die-cut so that I don't mess up my spacing. Any tiny pieces that I might not adhere well, I add a bit of Art Institute glue. After all that work - you don't want any pieces falling off in the mail! My last bit of embellishment is to add a Lawn Fawn Scripty Thanks covered in ultra thick embossing powder. I'm in love with that stuff!